What is the F Distribution Function? The F.DIST function is categorized under Statistical functionsFunctionsList of the most important Excel functions for financial analysts. This cheat sheet covers 100s of functions that are critical to know as an Excel analyst. 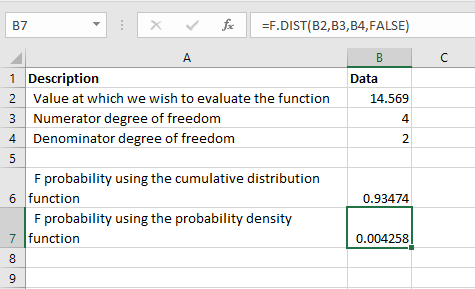 It will calculate the probability density function or the Cumulative Distribution Function for the F Distribution. It measures the degree of diversity between two data sets. For example, if we wish to find out the variability in the IQ scores of females vis-à-vis males, we can use the F.DIST function to examine it. As a financial analystFinancial Analyst Job DescriptionSee a real Financial Analyst Job Description including all the skills, experience, and education required to be the successful candidate for the job. Perform financial forecasting, reporting, and operational metrics tracking, analyze financial data, create financial models, the function is useful in risk management. We can use it to understand and evaluate the extent of losses that a portfolio can suffer. X (required argument) – It is the value at which we evaluate the function. Deg_freedom1 (required argument) – It is an integer specifying numerator degrees of freedom. Deg_freedom2 (required argument) – It is an integer specifying denominator degrees of freedom. Cumulative (required argument) – It is a logical value that determines the type of F distribution to be calculated. It can either be TRUE (uses the cumulative distributive function) and FALSE (uses the probability density function). To learn more, launch our free Excel crash course now! 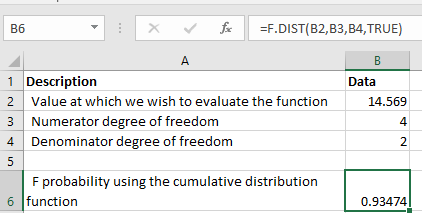 How to use the F Distribution Function in Excel? 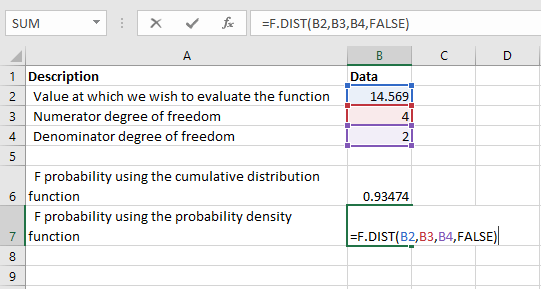 If either deg_freedom1 or deg_freedom2 is a decimal number, it is truncated to integers by Excel. The value of x provided is less than 0. The argument deg_freedom1 or deg_freedom2 is less than 1. #VALUE! error – Occurs when any of the arguments provided is non-numeric. Check our Free Excel Crash Course and work your way toward becoming an expert financial analyst. Learn how to use Excel functions and create sophisticated financial analysis and financial modeling.